The Fennec Fox is a small fox that lives in sandy desserts in underground dens. My Granddaughter went to Build-a-Bear a few weeks ago and acquired an exact replica of a Fennec Fox (12th in their series) from the company’s WWF (World Wildlife Fund) series. She was so excited about the creature that I decided to research the Fennec Fox and find out as much about it as I could. I'd like to share the information I found with you here. Fennec Foxes are the smallest species of the canids (carnivorous and omnivorous mammals) and the smallest fox known to man. They range from about 1.5 pounds to about 3.5 pounds. They have thin bodies and huge ears which enable them to hear their prey, as well as their predators, miles away or even underground. Their large ears also help them to dispell some of the daytime heat of the dessert. They build large dens in the desert sands of North Africa or Asia. Each den can have as many as 15 different entrances. The animals stay underground during the heat of the day and come out at night to hunt. Their thick fur protects them from the frigid night-time temperatures. Be sure to go to Build-A-Bear for more information on the Build-A-Bear WWF series of products. Fennec Foxes are considered endangered, however, they do not yet appear on the National Endagered Species list. Because they live underground and come out to feed only at night, it is hard to determine their numbers. Also, young Fennec Foxes remain underground for up-to 7 weeks before venturing out into the open air. Because the Fennec Fox is so fast, capturing one in the wild to tag is nearly impossible. Though considered endangered, Fennec Foxes can still be purchased and raised as Exotic Pets. In order for them to be domestic pets, they must be removed from their parents at about 2 weeks and hand-raised. Often they cannot be housebroken (some just do and others just don't). Fennec Foxes are extremely shy and many never become comfortable with human handling. If you chose a Fennec Fox as a pet, you should be prepared to have a pet that does not want to be held and can not be left to roam the house like a dog or cat. Also, Fennec Foxes must be registered as an exotic pet and may be illegal in your state or town. Be sure to check into this before you decide to invest in one as a pet. 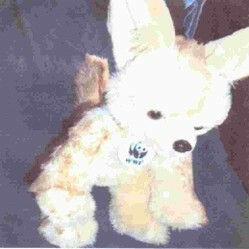 **The Fennec Fox shown above is the one my granddaughter received from Build-A-Bear. She named her Specially. Fennec Foxes feed primarily on scorpions and tarantulas. They will sometimes eat small rodents and small birds as well. Their diet is based on what animals and creatures roam the the dessert nights. In captivity, they will also eat fruits and vegetables. They can hear their prey under ground with their large ears and, since they are great diggers, they can dig for their prey with ease. The main predator of the Fennec Fox is the Eagle Owl which can fly fast enough to catch the animal. Other possible predators are Caracals-a medium-sized feline, Jackals, Striped Hyenas, and Saluki-a slim canine similar in appearance to the greyhound dog. Many who study the Fennec Fox however, feel that the other predators I mentioned are much too slow to catch one, and consider stories about such predators to be unfounded heresay. Watch the video below for more information about Fennec Foxes as pets. For more information on Fennec Foxes, go to the National Geographic wildlife page. The Philippine Eagle is the fast and agile of all the birds of its kind which considered as the tallest, rarest, largest and most powerful birds in the world. The biggest of the cats in the Americas are the Jaguars. These powerful cats of the jungle have long been revered and respected. The white lion is a beautiful animal. Find out why these lions are white and learn how they are doing in the wild. MBC, thank you so much. I am glad you liked my article. I based the article (if you couldn't already tell) on my granddaughter's Build a Bear plush. She was so excited about it. This little guy with the big ears is very sweet. Interesting article about a fox I didn't know about prior to your article. We have Red Foxes here where I live. What a fun Build a Bear plush. I see so many foxes near to my home and they are regularly in my back garden and in the road or the nearby park. They are clearly very successful omnivores. A glimpse of the Arizona desert wildlife and not so wild life, that I see from my back door.